As winners of the 2014 Royal Overseas League Ensemble Competition, the Solem Quartet enjoy a busy concert schedule at venues across the UK including Wigmore Hall, Queen Elizabeth Hall and Bridgewater Hall while also performing internationally in several European countries. They have been broadcast several times on BBC Radio 3, most recently as part of the 2016 BBC Proms. 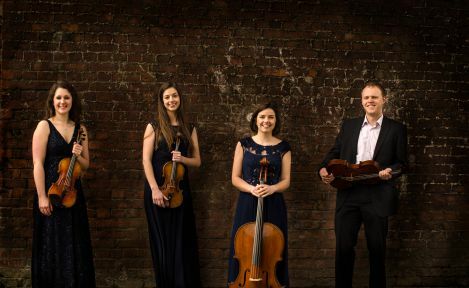 The quartet are currently Junior Fellows in Chamber Music at the Royal Northern College of Music, giving regular coaching to chamber ensembles as well as concerts throughout the year. They have recently been announced as 2016/17 Park Lane Group Artists and will give recitals at Kings Place, St. John’s, Smith Square and St. Martin-in-the-fields in the coming year as part of the PLG recital series. They have also been selected for a Tunnell Trust Award, through which they will undertake a tour of Scotland in 2018. Since September 2016, they have been Quartet-in-Residence at the University of Liverpool. They have furthermore been privately commissioned to undertake a complete Beethoven cycle, to take place over five years starting in 2017, in Aberystwyth and London.